Is logic a predominantly male thing? Yeah, you guys out there, I know, I know. Don’t shout “Of course it is!” at me. I might just agree…. surprise, surprise! Because I went for a coffee. I took the Harley for the first ride of the season. The sun was out and there was no stopping me. I needed to be on the road again. The air was still cold, especially going over the mountains, the sun has not the power yet to warm quickly. I guess there were no more than 5 to 7 degrees when we set off. But what a joy it was to start her (she kicked in at the first try) and roar along empty country roads. After an hour the cold started to creep into my fingers. My cheeks and chin felt frozen, the half helmet not protecting much. I ached for a coffee. My body ached for warmth. 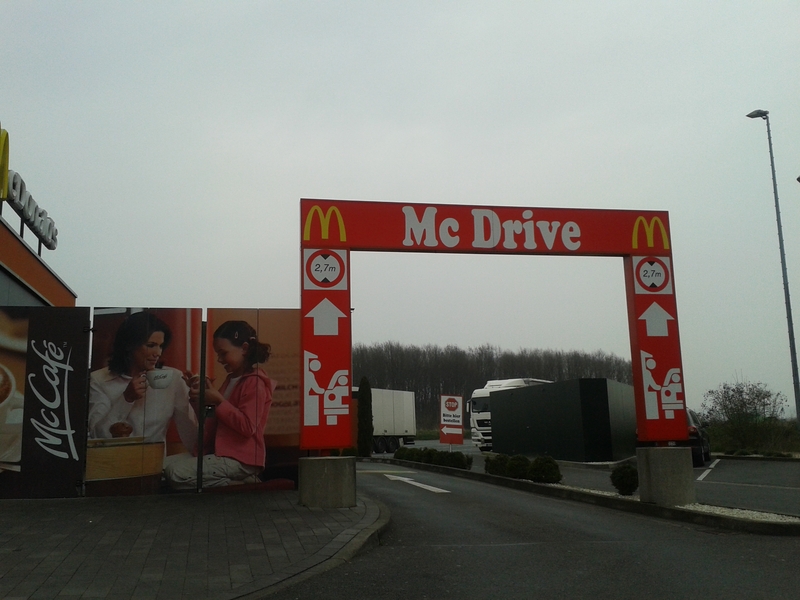 So I stopped at McDonald’s. I left her right opposite the front door and walked in. Clammy fingers nestled with gloves and sunglasses, trying to get my wallet out of my pocket. A young woman seemed busy behind the counter, though for no apparent reason because I was the only customer. She was all done up, heavy make-up and an attitude to go with it. “A large café latte to drink in!” was what I said to catch her attention. The words were difficult to get out because my chin felt frozen. She gave me a look through dark mascara lashes and carefully pressed the order into the touch screen, making sure that her perfectly manicured fingernails with golden glitter varnish took no harm. She gave me another one of these I-am-bored-like-hell looks and said. I couldn’t believe this stupidity. Not only had I told her I was staying in. 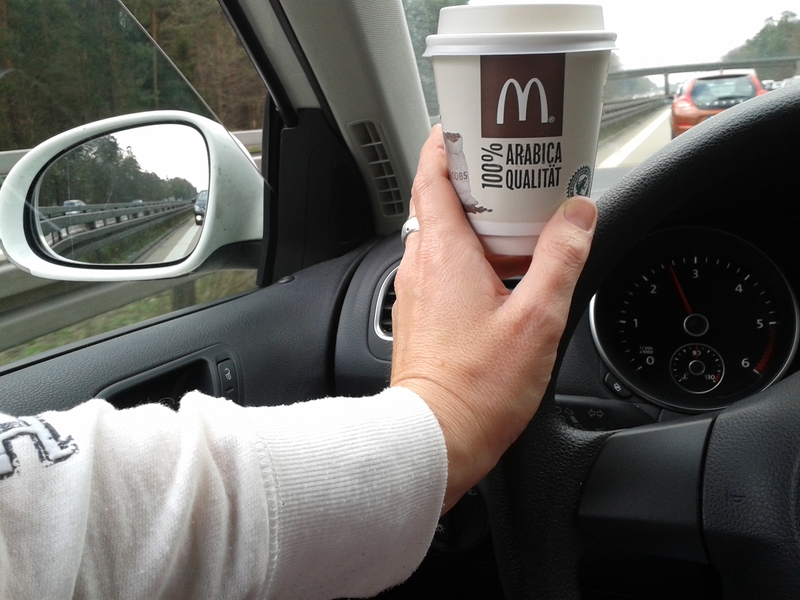 How on earth did she expect me to drink the coffee while I was driving??? Ever tried that on a Harley? Well, she obviously never and it took me some time to get over so much stupidity. I finished my latte and walked out into the sunshine. Harley waiting. While I got ready to go (gloves, lid, jacket and things) I noticed a wee boy who kept a safe distance of about 20 meters. He can’t have been older than two and a half years. The wind played with his blonde curls, blue eyes followed every movement I made while all the time he held his two little hands quite firmly pressed on his ears. That wee man knew it was going to be loud the minute I started the engine. He was prepared. And he was absolutely fascinated. I started the engine and a smile washed over his face. I smiled back at him and drove off waving a gloved good-bye to him. When I was about 50 meters away he waved back. He had waited until it was safe enough to uncover his ears. How much logic in such a young boy and how little in a woman ten times his age.